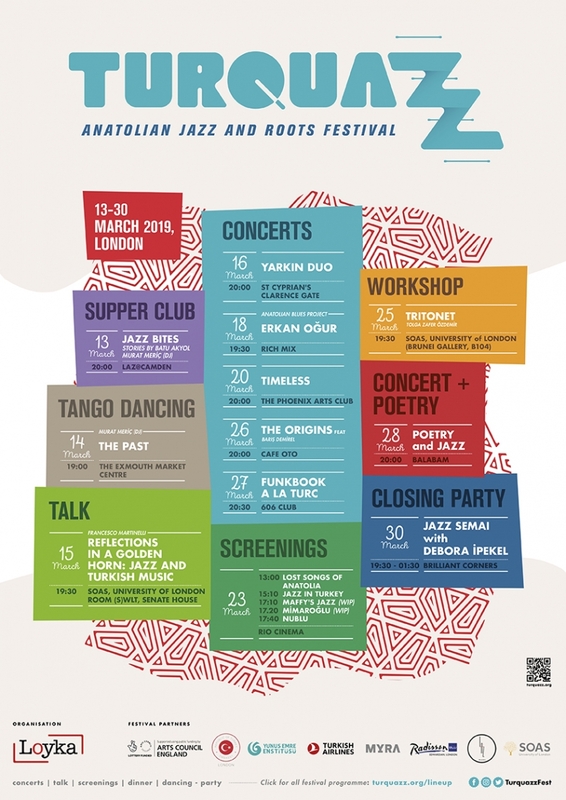 This gig is part of an exciting new multidisciplinary music and arts festival in London called Turquazz, shining a light on Anatolian jazz and culture emanating from Turkey and its surrounding regions. Funkbook a La Turc features the highly respected Turkish guitarist Önder Focan along with the multi Award winning frontline of the Şalliel Brothers on saxes, supported by one of the finest rhythm sections to come out of Turkey. Onder Focan is one of Turkey's most sought after musicians as a guitarist, composer, arranger, educationalist and lyricist. A highly experienced performer his fluent and creative playing has, over the last 3 decades, made him the guitarist of choice for innumerable bands and artists including the likes of Kurt Elling, Dee Dee Bridgewater, Roy Hargrove and Ron Carter. He has appeared at over 90 Festivals worldwide, has released 13 CD’s and is the founder and artistic director of one of Turkey's most prestigious venues, the Nardis Jazz Club (now in its 17th year). With the encouragement of his saxophonist father Mümin Şallıel, saxophonist Batuhan Salliel was already working as a professional musician by the time he was 15 and in 2014, at the age of 19, he won the finals of the Riga Jazz Competition as well as the Grand Prize Best Jazz Improvisation Award. Featured on the "Best of Riga" Jazz album he has already appeared at more than 15 Festivals around Europe and over the last 5 years has been heard with many jazz, fusion, pop and pop-rock musicians, including the Salliel Brothers’ What Da Funk Project and the Istanbul Superband. Completing the front line is Batuhan's saxophonist brother, Anil Salliel. Anil started performing professionally when he was 14 and by his late teens was part of Orhan Osman’s ‘Turkophony’ project alongside Dave Weckl. Anil takes great pride in his ability to work in many different styles without losing his musical personality, which has led to him being first call player in a phenomenal recording career leading to appearances on over 800 albums, plus numerous film soundtracks and jingles. As well as work with Onder, Anıl also leads his own project ‘What Da Funk’ with his brother, Batu. Completing the band tonight will be Halil Ibrahim Isik on piano and keyboard, Mehmet Ozen on bass and Erhan Seckin on drums. Tonight's project is the third part of a series – previous projects were ‘Standard’ and ‘Swing’ A la Turc. The music that the band plays can best be described as a funk driven assemblage of Turkish songs and Onder's originals, borrowing from not just jazz but also folk and urban styles. The material for the evening will be largely derived from the album that Onder and the Salliel brothers released in December 2018. An innovative evening featuring musicians of international standard, rarely if ever heard in the UK.